Over Memorial Day I met my friend Trina at Explore Park and we took the boys hiking. 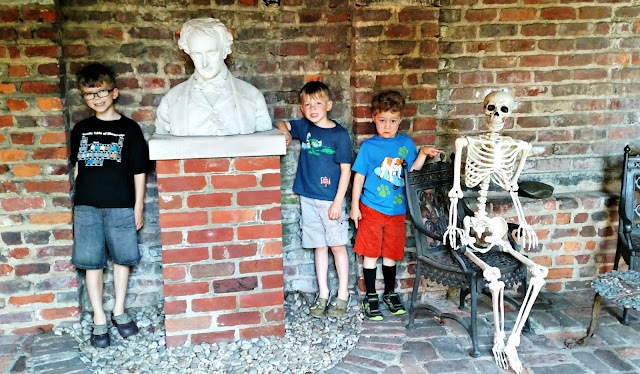 She used to work there, and was able to tell the boys all about the interesting historic buildings scattered throughout. What makes Explore Park so fun is that they have little settlements from different centuries all through the park. While hiking, we saw many turtles and dragonflies, and heard some bullfrogs. Things were going quite well until we reached the 19th century. 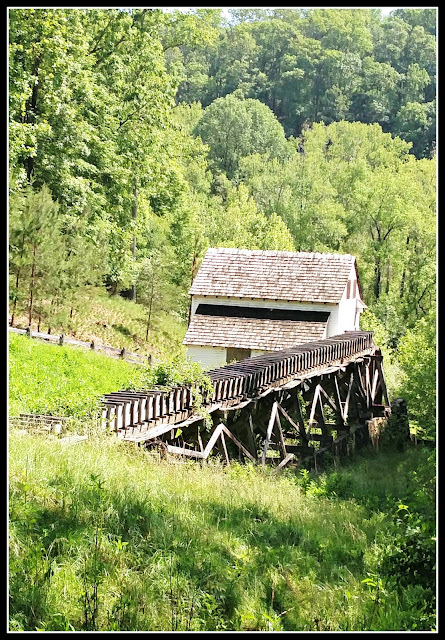 As we were hiking by the blacksmith shop, the strangest thing happened. My hiking boots somehow tied themselves together IN A KNOT and I fell flat. I scraped up both hands and a knee. How is it even possible for two boots to tie themselves together? We'd been hiking already for a stretch and everything had been fine up to this point. The boys are convinced now that Explore Park is haunted. Or perhaps just has a few fairies - Pierce read in his Ripley's Believe it or Not book that fairies like to mess with shoes. This is a picture of a grist mill in Explore Park - it is not original - it's a replica. Still, it's quite charming nestled in the valley like this. Readers, have you ever heard of shoelaces that tie themselves together? Or mischievous blacksmith ghosts? I just love basil. 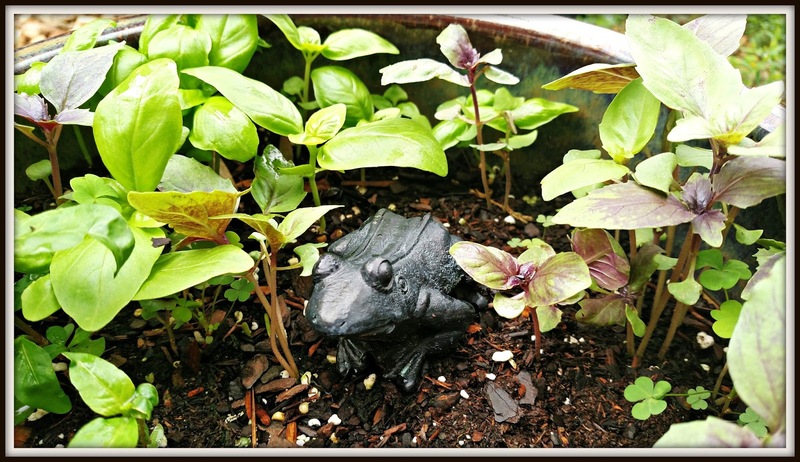 I've got a few pots of basil planted around the house. I've already dipped into it some for a frittata I made, but mostly I like to use it on pizza and to make pesto. Dried basil just can't compare to fresh. I have a number of other herbs planted as well - a few didn't come up but there are a good number that are in the business of growing. 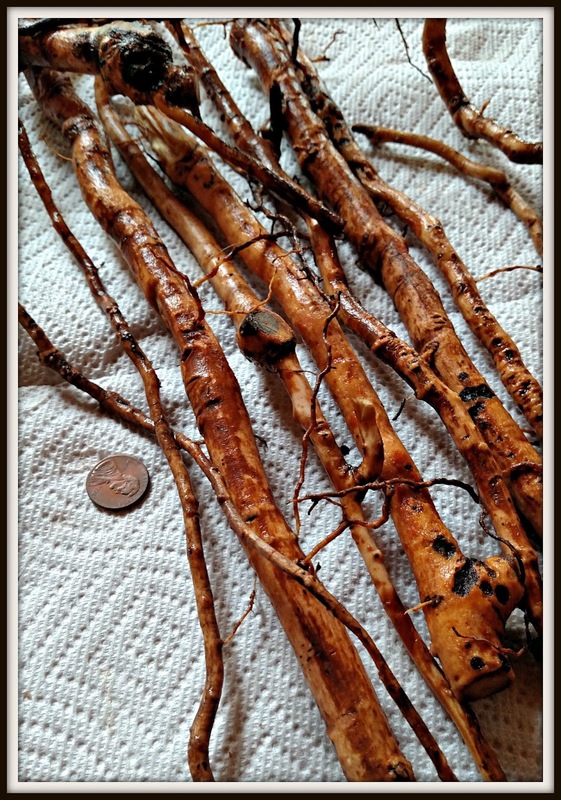 Readers, which herbs do you like? We have sassafras growing all over our land. The leaves kind of look like a mitten. We heard that the roots were good for making tea. Paul went and dug some up for me. I cut them into little pieces and steeped them for 20 minutes, then added cold water to make a gallon. The flavor tastes a little like root beer. It's incredibly refreshing. Sassafras does contain safrole, which is a carcinogen, so you want to enjoy it in small doses. Readers, have you ever tried sassafras tea? It sure does get exciting once I can start pulling things from the garden to eat. 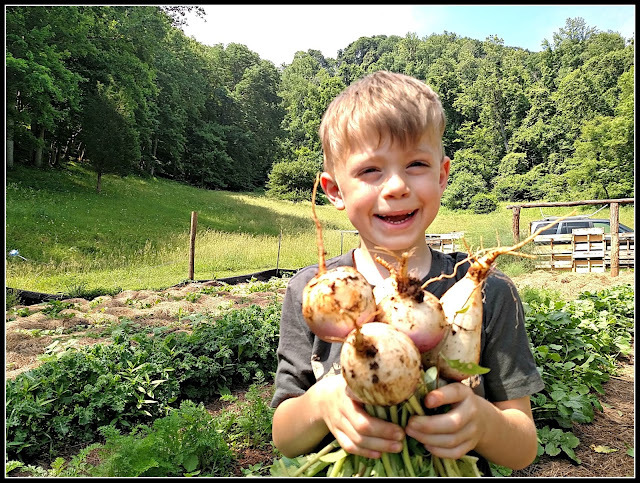 This month many of the root veggies have been ready to pull (along with kale and spinach and peas). We've had turnips and beets and carrots. Plus radishes. I don't actually like radishes. Not normally. But I plant them to help control the bugs. However, a few years ago I tried them pickled at a Korean restaurant, and they are pretty tasty that way. 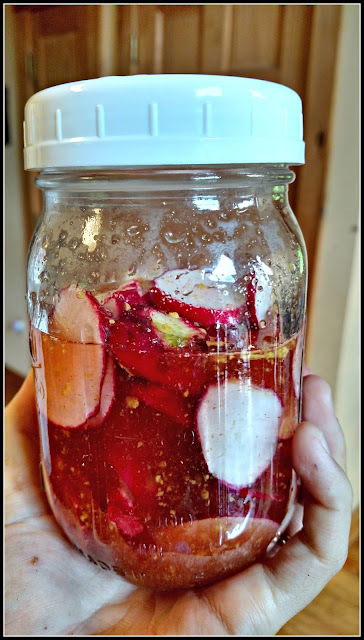 I did a test run with pickling a few in the fridge. I used a random recipe off Pinterest. They turned out amazing! So now I eat radishes too. Cort also loves them - he'd eat the whole jar if I let him. Readers, do you like the root vegetables? 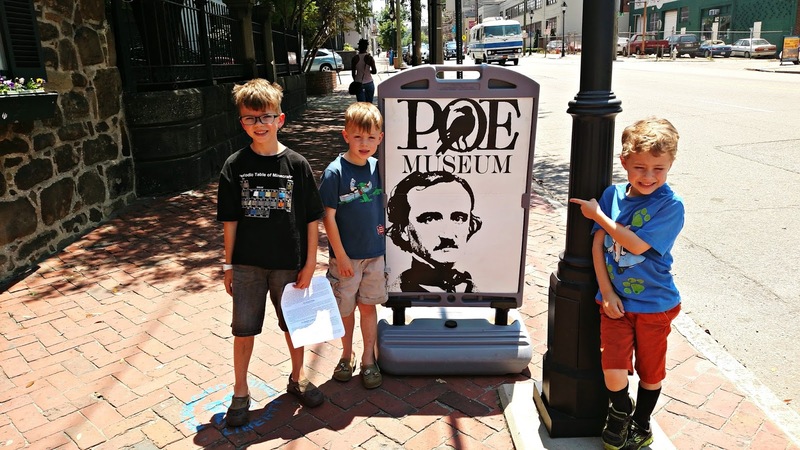 Pierce invested a lot of time over the past couple of months memorizing the entirety of Edgar Allan Poe's poem The Raven. He's read a few books on Poe as well. 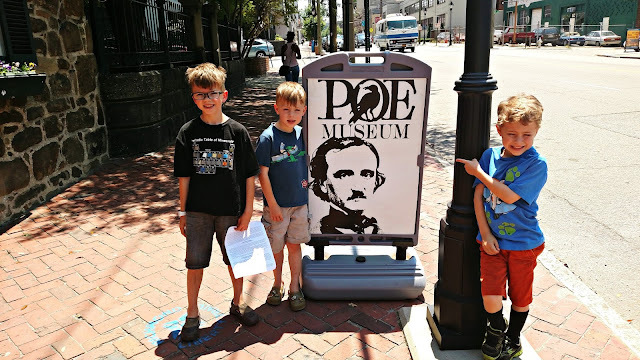 So on our way back from DC, I surprised him with a detour by the Poe Museum in Richmond. 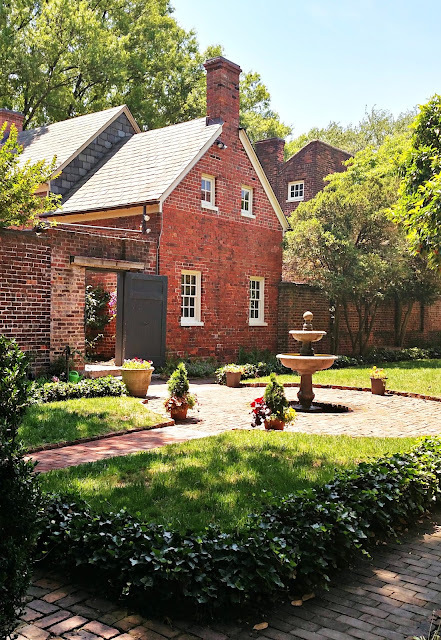 Although Poe didn't live in this house (the houses he lived in in Richmond were all torn down), the house is quite historic, and they had a number of items from Poe inside (like his childhood bed). No pictures were allowed in the buildings. This was taken in the courtyard. Supposedly there are two black cats living there, but we were not lucky enough to see either of them. Before leaving, Pierce recited The Raven for the customers in the museum gift shop, and they all applauded enthusiastically. He bought a tiny plastic raven that says 'Nevermore' as a souvenir. I've mentioned before that Bobby likes to go hiking. One day I went for a walk on my own and he came along. 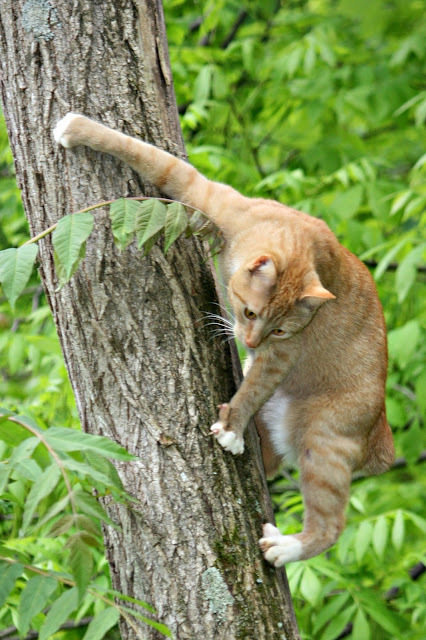 He likes to make mad dashes up trees. 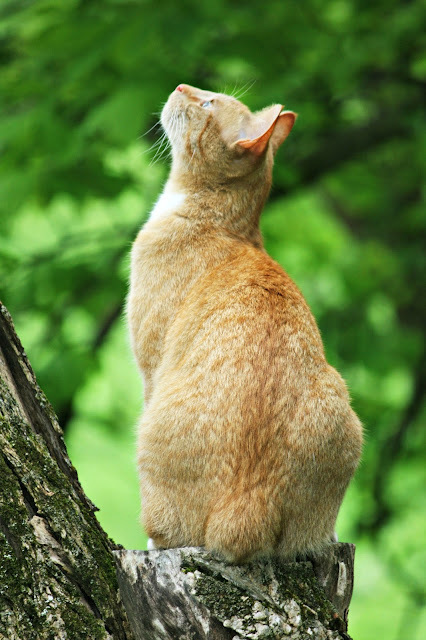 I was lucky to catch this brief, quiet moment, while he looked for birds and squirrels. 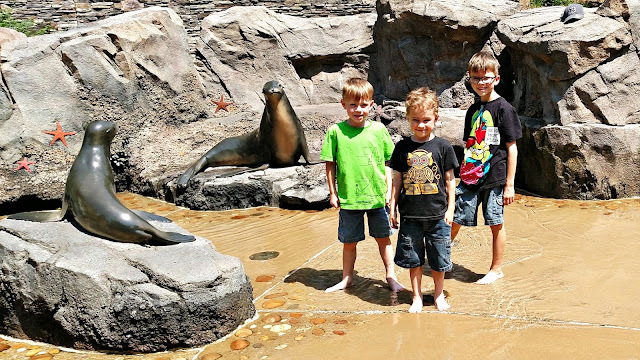 During our trip to DC I hadn't really planned on going to the National Zoo. It's a little out of the way of most of the museums, and it is huge with lots of walking (and the day we were there was 90*). However, the twins had watched some movie in Social Studies about the baby bald eagles at the zoo, and were insistent that we needed to go. So, we made the detour to head up there. It was actually a good move, as the pandas were active that day, and every other time I've been they weren't out. The boys found a fountain to splash around in and cool off some by the seal exhibit. It really was a hot day! 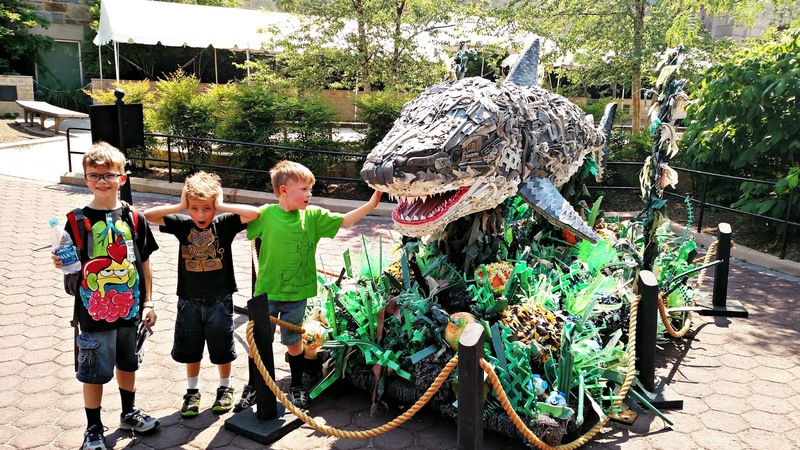 The zoo had a special art exhibit sprawled throughout that featured sea life sculptures made from trash. They were all excellent. 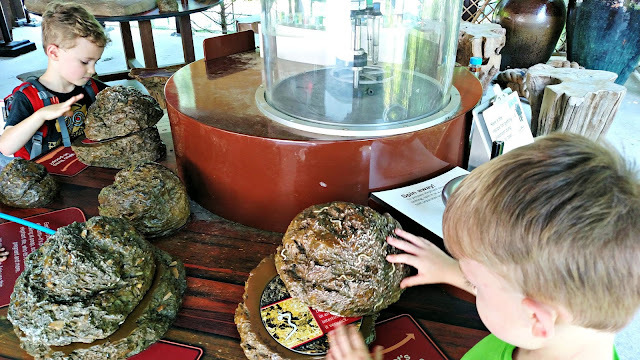 It doesn't get much more exciting than getting to examine elephant poop up close and personal. We did make it by the eagles, but as I was only taking pictures with my cell phone (I had enough to keep up with that day without lugging around my real camera) I don't have a picture. But the twins were thrilled to see them. We only made it through half the zoo before heading back to the mall area so we could catch the Museum of Natural History before it closed. Cort really want to see the Minerals and Gems exhibit. He's still obsessed with rocks. Readers, what is your favorite zoo animal? The day after school let out, I woke the boys up early and told them to load up in the car because we had errands to run. They didn't say much until I merged onto the interstate headed north. Pierce asked where, specifically, we were going. I told him a grocery store, a camping store, and to pick up some books. They were quiet a while longer, but then started asking again. I told them the camping store was "a ways up the road". We ended up at the Green Valley book fair, and they were delighted I had tricked them. After picking out books, I strategically loaded them up with some fast food distraction before merging back on to the interstate - north, again. As we were passing a sign that said, "Manassas 10 miles", Pierce asked if we were in back in our hometown yet. Were they ever surprised to find themselves in Northern Virginia! We had dinner with friends that night and the next day rode the metro in to DC. 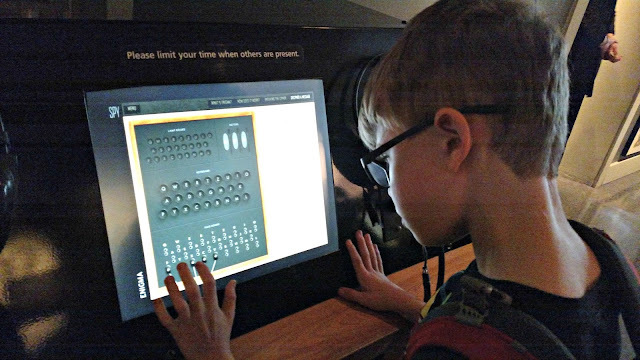 Our first stop was the International Spy Museum. The boys loved the creepy blue light elevator to get inside. 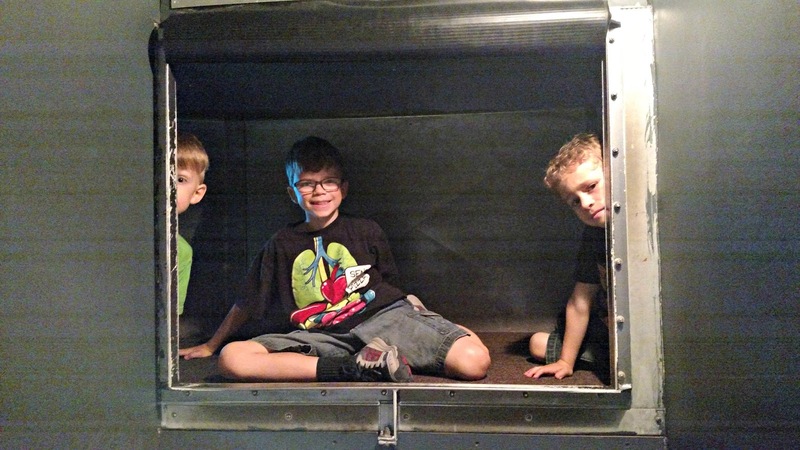 And being able to crawl through the duct work to spy on museum-goers was a huge hit. There were many hands on activities mixed in with a lot of artifacts and history. The boys liked all the buttons. There was also a hallway that had a movie of a shark swimming behind glass, and if you touched the glass the shark would attack it, 'breaking it'. I wish I'd gotten it on video the first time this happened. The boys did it over and over and over again. They love being scared or surprised. 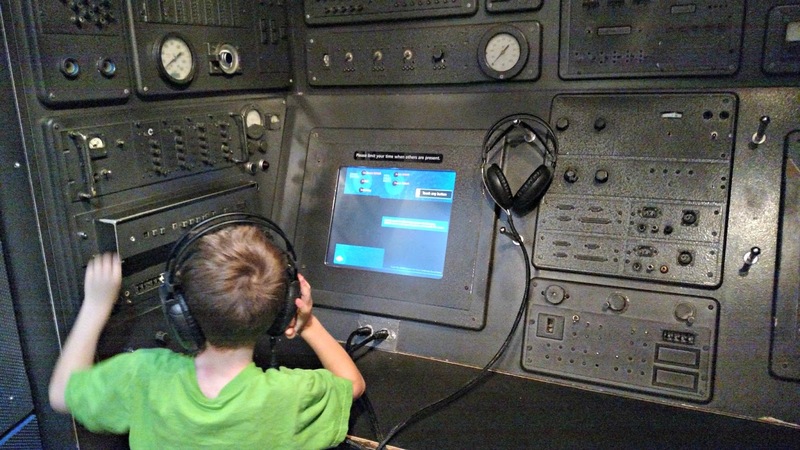 We had an excellent time touring the museum, and although it is not free like all the Smithsonians, I think it is worth the expense for one time. I found an unopened 3D puzzle at a thrift store for $2. The twins started working on it and became obsessed. So much so that they couldn't go to bed. Luckily it was a weekend night. But after being told to go to bed several times, eventually the puzzle had to be removed from the room so they could sleep. The next morning? They were up bright and early to keep working on the puzzle. 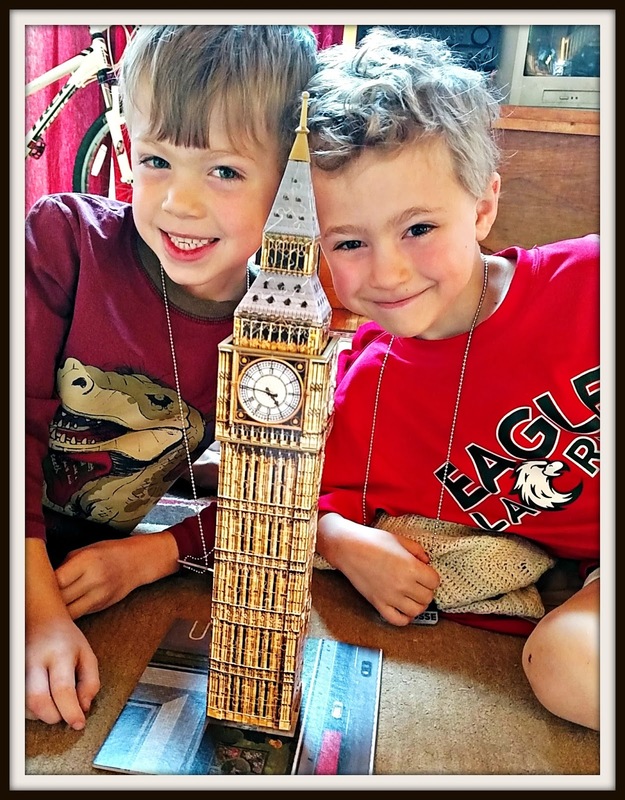 They got Big Ben put together, and were so excited about it. I think I need to find more of these! What fun. For my mother's birthday (which is today, happy birthday!) I had to go to the liquor store. My mom doesn't actually drink liquor, but she wanted to start making some tinctures like the ones I've been making from native plants. I got her the two Rosemary Gladstar guidebooks that I've been using for Mother's Day, and decided to get the items she'd need to make the products for her birthday. Things like the little bottles and jars. And, as you may remember, some of the recipes call for vodka. So I found myself at the liquor store, where I don't go very often. Years could pass without me setting foot in a liquor store, which is probably good since the minute I enter through the doors I am consumed with guilt. As though I've already done something wrong (I have no similar guilt over buying a bottle of wine at the grocery store - but something about the liquor store does this to me every time). Like just in crossing the threshold I have done very bad things. I found the vodka and then something strange happened as I was meandering my way out of the store. It started with the amaretto. 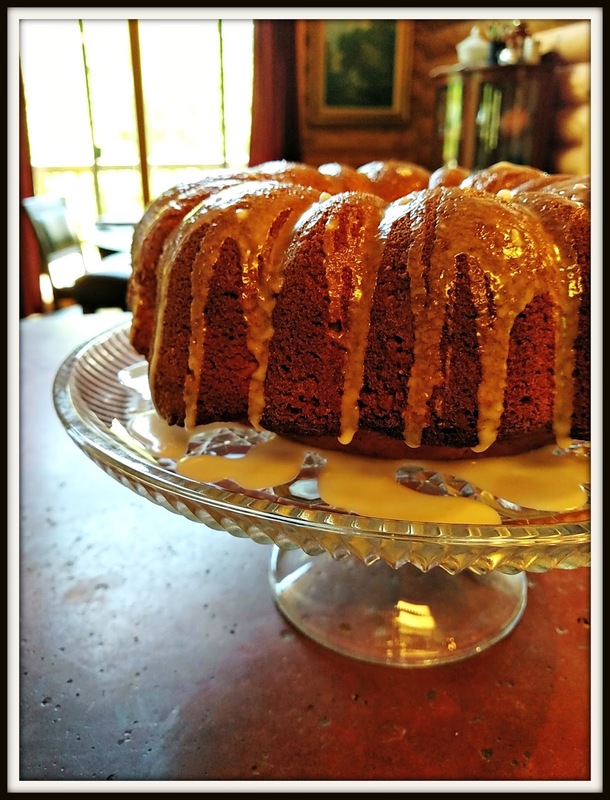 Instantly I felt the need to make amaretto cake. Then there was the Malibu rum. Didn't I see a recipe for Malibu rum cupcakes recently? As you might imagine, I had major impulse buy fails, and then I'm walking to the checkout with my arms loaded by two bottles of vodka, a bottle of amaretto, and a bottle of Malibu rum. Party at my house! 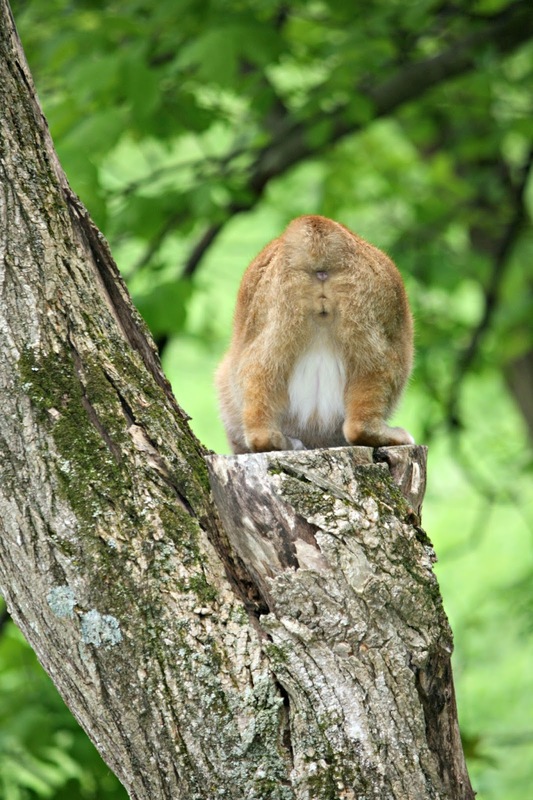 I hung my head in shame as the cashier scanned my driver's license. Is there a limit to how much you can buy? Was he going to flag me for future stores? Still...I must say. That amaretto cake? It made it all worth it! Readers, do you like any drunken sweets? I love yard games. I've got a nice collection now from yard sales and thrift stores. Sometimes I set them all up in the riding arena for the weekend. It makes for a nice break from other projects. Ladderball. One of my favorites. 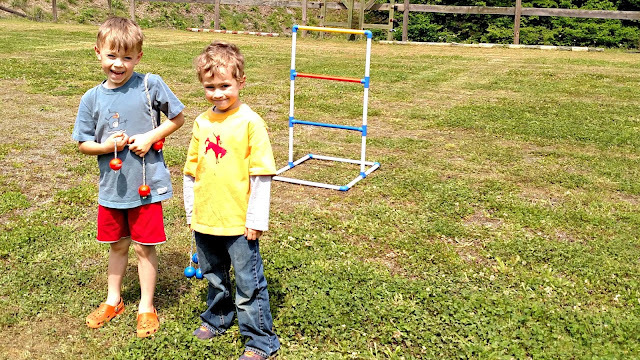 Paul and I first learned about ladderball on a camping trip up North in Michigan, where everyone in the campground seemed to have brought their ladderball but us. Croquet. I still don't know if we're completely playing this right. But we have fun trying. 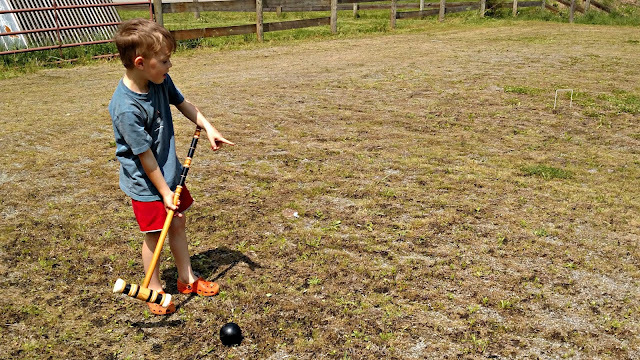 And bocce ball. A new yard sale find this year. We played this with Paul's parents when we visited them in Nebraska a couple of years ago. As you can see, my house is so boring and there's nothing to do on the weekends. 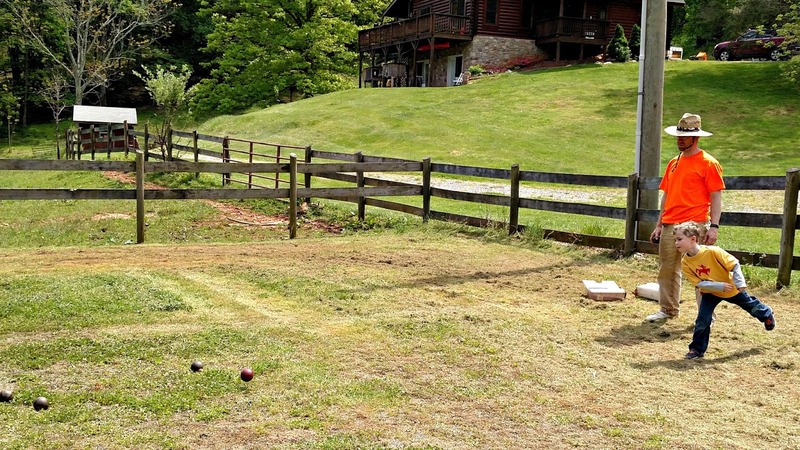 Readers, do you like yard games? Do you have a favorite? Last winter my in laws gave Paul and I a spare Vitamix they had, which we have really enjoyed. They sent us an attachment to grind flour from wheat berries, but I hadn't had a chance to use it because I had a hard time finding the hard white wheat berries in small portions to give it a test run. I finally tracked some down at a health food store and tried it out. It only took one minute to grind a couple of cups of flour. Once I figured it out, it was so easy. Smelled really nice too. I made some bread with this. I used my typical bread machine recipe but it turned out rather dense, so I'll have to play with that some. Everything seems to have its own learning curve, but it's fun to travel those curves. 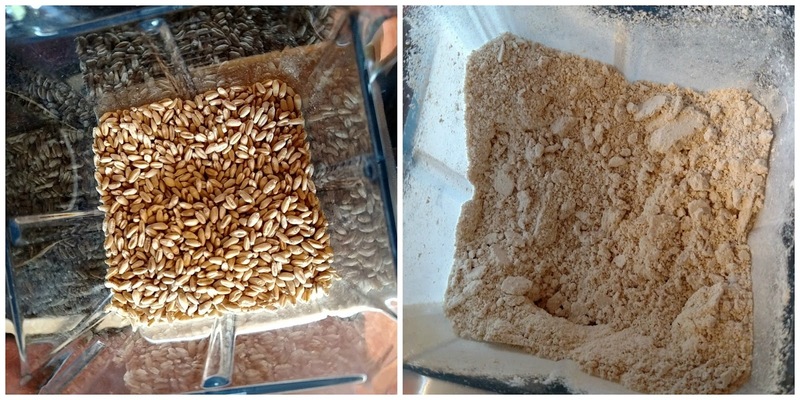 Readers, have you ever tried to make flour? The boys camped out a couple of weekends ago. I hiked up and hung out by the campfire, but it was chilly and I am fond of my bed and down comforter, so I hiked back down to sleep. 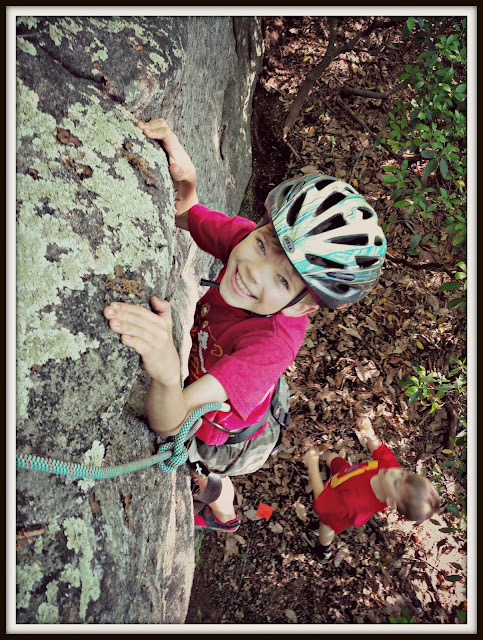 The boys had rigged up some rock climbing gear on a big rock by the campsite on top of our mountain. Pierce can scrabble his way right up the rock. The twins had fun with it too. All three boys just love camping out - even during chilly weather and rain! Readers, do you like camping?